Fabric is raised or lowered with rope which runs through pulleys on the top rail and rolls out of the way when not in use. 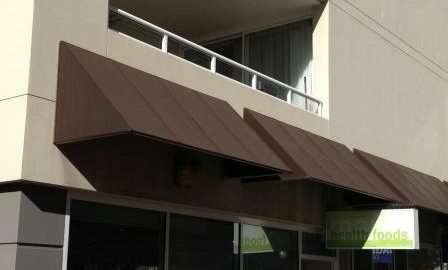 An attractive, easy and affordable awning that adds privacy and protection from the wind, sun and rain. Robusta is a strong drop arm awning suitable for a wide range of domestic and commercial applications. Offering a wide range of projections, widths and a choice of control options. Heavy-duty drop arms and roller tube allow widths of up to 7m and make Robusta ideal for larger windows. Adjustable springs on the arms ensure outstanding fabric tension and a stylish hood adds to the appearance, while protecting the fabric and roller tube from the wind and rain. Operation options are available both internally or externally with standard crank or optional motorisation. 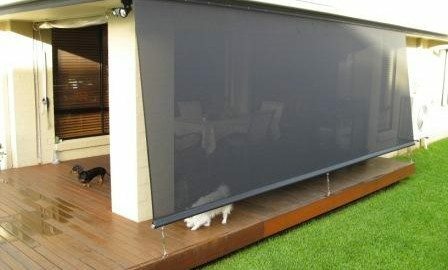 Maximise your outdoor living area all year round using PVC Blinds. Clear or Tint PVC Blinds offer great protection from the cold, wind and rain and can be used for entertaining in all seasons. They are available in different operating systems for ease of use, practicality and affordability e.g. Ziptrak System, Rope & Pulley or Gear Operated. Manufactured with marine grade UV stabilized commercial zips, you can be assured of the quality of our PVC awnings. All our PVC Blinds come with standard coloured borders to add a touch of style and strength to the blinds. The Wedge Awning is used in situations where a more robust frame is required as the wedge shape is much stronger than a traditional hood, offering less fabric resistance. In addition to the strength benefits of a wedge frame awning, the sleek and angular look complements modern minimalist style and decor. Ziptrak® Awnings are the ideal way of enclosing your patio for a 100% weatherproof result. The fabric is restrained in aluminium side channels and the bottom rail clicks into a secure locked down position making a strong barrier to wind and rain. They are available with gear operation or spring loaded. Available in a range of fabrics including; PVC Clear or Tint, Mesh or Draylon. A fixed frame hood, great for walkways and above doors. Frame is made from custom-molded aluminium with powder coating is available on request. It is fixed to the wall above and sealed to eliminate rain water seeping between the wall and hood. Available in a range of fabrics including; Draylon, Canvas or Vinyl and edged with colour co-ordinated spline. We can provide you with privacy screens customised to suit your individual needs, with all different shapes and sizes available. These can be made out of total blockout, or most commonly the 2×2 weave mesh which is 95% blockout, keeping the majority of the weather out. This is the ideal solution for hot, enclosed areas, allowing air flow and maintaining outward-looking view. The ideal solution for properties built closely along boundary lines, providing much needed privacy between the two properties. Automatic Roll-up … A robust awning to protect windows from heat and glare. It can be pulled up and down to stop at any given point, and retract back up into a weather box. This awning is available with colour co-ordinated weather box, bottom rail & arms. Cloth and roller are fixed within the weather box. A wavy valance is standard; a straight valance is available upon request. Weather Box if required is Colorbond or can be powder coated in any colour. Fabric … Available in Acrylic, Canvas and Mesh, all with a 5 year Guarantee against UV and stitching breakdown. Guides … Standard 316 marine grade stainless steel. These are screwed to your wall or posts to enable the arms to glide freely up and down. Auto Arms … Powder coated to match your house with UV treated black polymer end fittings. Projection of the arms can be: 150mm, 300mm, 450mm. Larger arms are available upon request. Always roll up your awnings in high winds and storms.